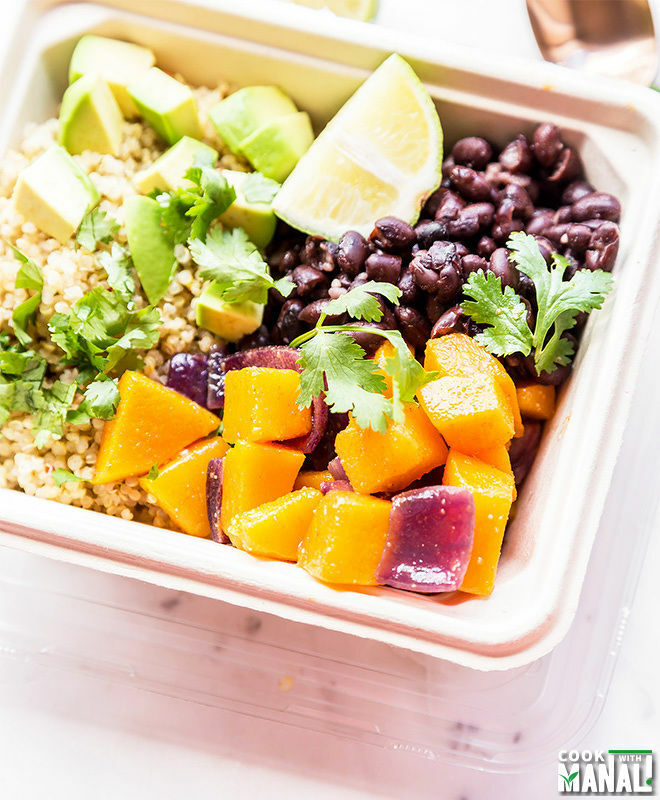 Vegan and gluten free Quinoa Butternut Squash Burrito Bowl is a delicious and healthy meal which doesn’t take much time to put together. The squash and pumpkin season makes me very happy! The other day we went to a grocery store and mom got so excited to see all the pumpkins. She had not seen pumpkins in so many shapes and sizes before so it was totally a new experience for her. In fact she asked my husband to click few pictures of the pumpkin for her! I really love fall for all it’s flavors and fresh produce and butternut squash is right up there. My favorite way to eat it? Yes you guessed it right, it is by roasting the veggie. I discovered roasting veggies pretty late in life but now I really believe that roasting is the best way to eat any vegetable. It just makes everything so darn tasty, agree? 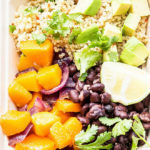 I have been making these Quinoa Butternut Squash Burrito Bowl a lot these days. 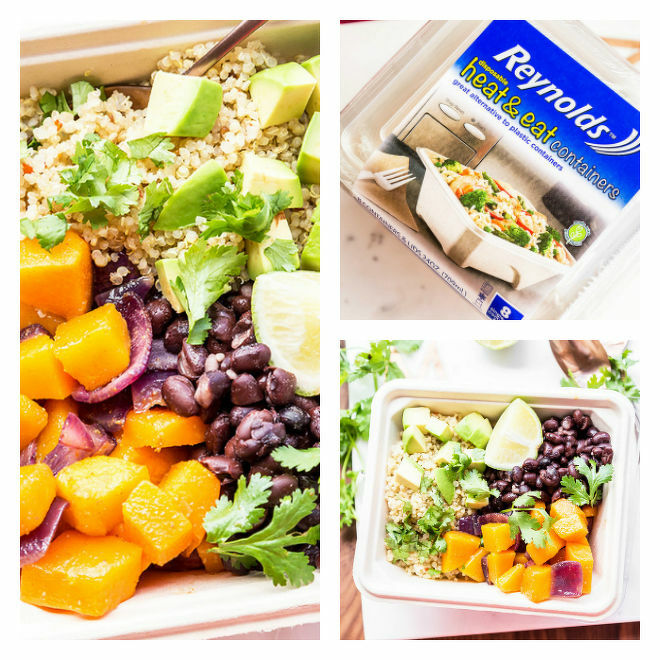 First of all it’s the squash season so I need to make the most of it and then I need a quick lunch which I can pack easily in my Reynolds™ Disposable Heat & Eat containers and this recipe fits the bill so perfectly! You see, I have to carry lunch for my mom and dad a lot these days. Most of the time they are in hospital, I come back home, make lunch and then pack it and take it for them. There are 2 things which help me get through the entire process easily. 1. using dinner leftovers: seriously it saves so much time! I often cook a lot of quinoa and then use some of it for a quick salad for dinner. The leftover quinoa I use in a lot of recipes like these burrito bowls! Using dinner leftovers to create a delicious lunch is something which I do very often, not only does it make lunch prep easier but it’s also fun to get creative using the leftovers. 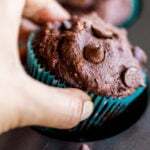 You can check out some great leftover recipe ideas here. 2. Reynolds™ Disposable Heat & Eat containers: they have seriously become my new favorite. I use them almost everyday to pack lunch for my parents. They are easy to handle and fit easily into my bag. Bonus, they are made with with plant fibers and are a great alternative to plastic. They are also super easy to microwave and there’s practically no clean up involved! Yay! There’s so much more than you can add here like peppers, corn. You may also add cheese, salsa or make guacamole in stead of adding diced avocados. I am really running short of time while packing my lunch so I make it this way. It’s super flavorful! My mom who has never had quinoa before absolutely loves it. You know you have a winner recipe on hand when healthy is also delicious. I hope you guys like this easy recipe. 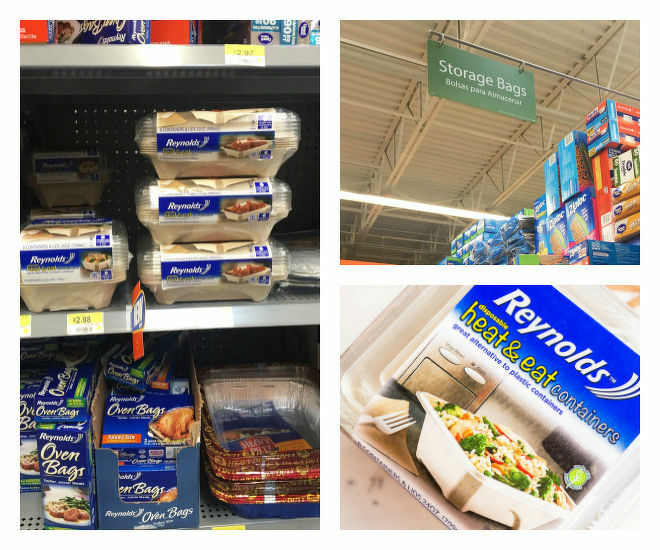 And also don’t forget to check out Reynolds™ Disposable Heat & Eat containers. You can find these at your local Walmart store in the food storage aisle. Here’s a $1 off coupon for you guys to try! Line a baking sheet with parchment paper and set aside. In a bowl toss together squash cubes, diced onion, salt, cumin powder, cayenne pepper and 1 tablespoon olive oil. Mix to combine. Transfer everything to the prepared baking sheet and roast at 400 F degrees for 15-17 minutes or till squash is fork tender. Set aside. 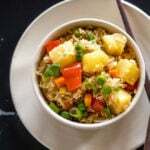 Measure 3 cups of cooked quinoa in a bowl and add salt, cumin powder and red chili flakes to it. Mix to combine. To prepare the bowl, divide the quinoa and butternut squash mixture equally in 2 parts. Add 1/2 cup black beans, diced avocado, cilantro and lime to each and serve. You may add any additional topping of your choice. Suggestions include: salsa, sour cream, cheese, guacamole. * I add in a lot of lime juice to these burrito bowls – 1 small lime for each. You may add less depending on taste. 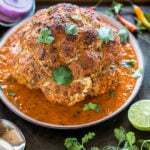 * Don’t forget to check out delicious recipe ideas using leftovers here. 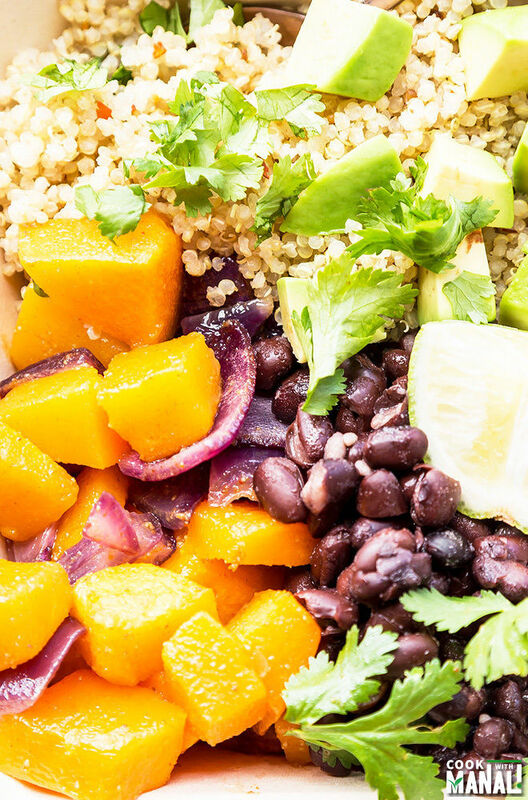 Quinoa Butternut Squash Burrito Bowl is a flavorful meal which you can whip up in no time! It's healthy, delicious, vegan & gluten free! Preheat oven to 400 F degrees. Line a baking sheet with parchment paper and set aside. 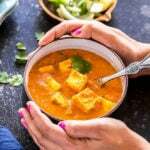 In a bowl toss together squash cubes, diced onion, salt, cumin powder, cayenne pepper and 1 tablespoon olive oil. Mix to combine. Transfer everything to the prepared baking sheet and roast at 400 F degrees for 15-17 minutes or till squash is fork tender. Set aside. To prepare the bowl, divide the quinoa and butternut squash mixture equally in 2 parts. Add 1/2 cup black beans, diced avocado, cilantro and lime juice to each and serve. I love eating butternut squash as a roasted veggie, too! Such a great flavor and so perfect for this time of year. This burrito bowl looks fantastic, Manali! I love the quinoa in here, too. This is my kind of meal! Impossible to see the recipe on my smartphone. The ads cover everything. Can this be fixed or shall I unsubscribe? Hello Lin! Sorry you are having trouble reading the recipe, I will definitely try to fix this. Thanks for the feedback. 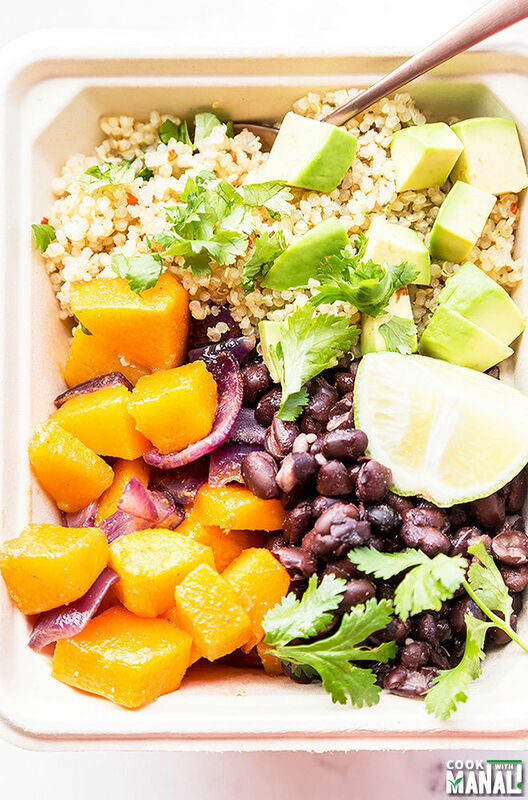 Oh I love a good burrito bowl…and this is definitely the time of the year for roasted squash! Laura and I were just saying that we need to mix up dinners with something healthy…and this one just might fit the bill! 🙂 Glad your Mom enjoyed the pumpkin tour. Haha! Thanks David! 🙂 burrito bowls are my favorite! I am a HUGE fan of make ahead lunch recipes, they are an absolute life saver. Love this burrito bowl, and I definitely need to find some of those containers! 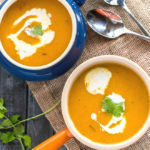 Butternut squash is definitely my favorite fall veggie! And I’m all for make ahead, delicious lunches, so this burrito bowl is right up my alley! Love all the components of this dish, girlfriend! So pretty AND yummy! Winning for sure! Thank you Chey! I love a good burrito bowl! The seasoning in this quinoa sounds delicious! And I’ve been eating a lot of squash lately, so this is definitely for me! Healthy and satisfying bowl! Roasted sweet butternut squash with spices would add a lovely flavor combo! Thank you! Roasted butternut squash was so good! These burrito bowls look so pretty and colorful, Manali! 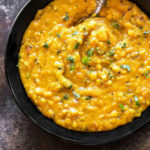 Love butternut squash season, it sounds perfect with all the goodies in this bowl! I am all about a burrito bowl. I always make such a mess of eating burritos, so this is the perfect alternative. A delicious flavour combo here too. I always go for the bowl, eating burrito is challenging! These bowls look fabulous and I love how those Reynolds heat and eat containers are make them so easy to take to work! 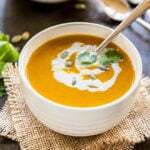 Love butternut squash and quinoa, too! This looks like the perfect lunch!!! Oh my yum! 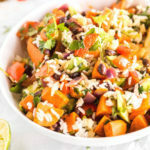 Burrito bowls are my FAVE and I’m loving the sound of this made with butternut squash too! Perfect meal for the fall! Oh my goodness! 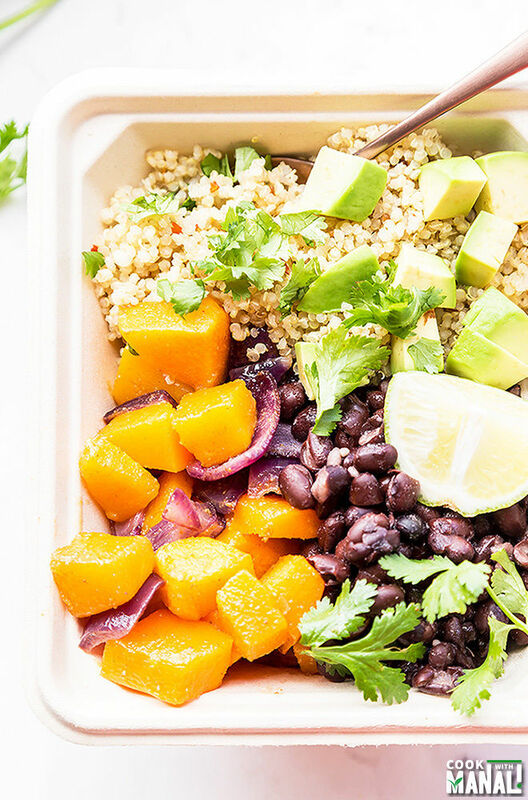 The colors in this burrito bowl are absolutely gorgeous! Pinned! Thanks for the pin Rachelle! 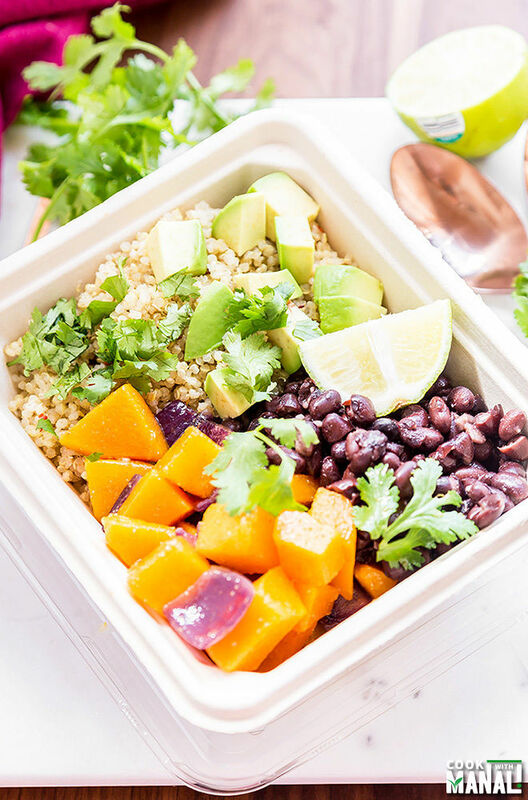 From the cumin flavored quinoa to the gently spiced butternut squash to the black beans and to the avocado – I am loving everything about this burrito bowl – simply delicious Manali! Oh yum! i love this combo, you really can do quinoa 1000 different ways. Love this!